We've been investigating the business for months. Here's what we found. 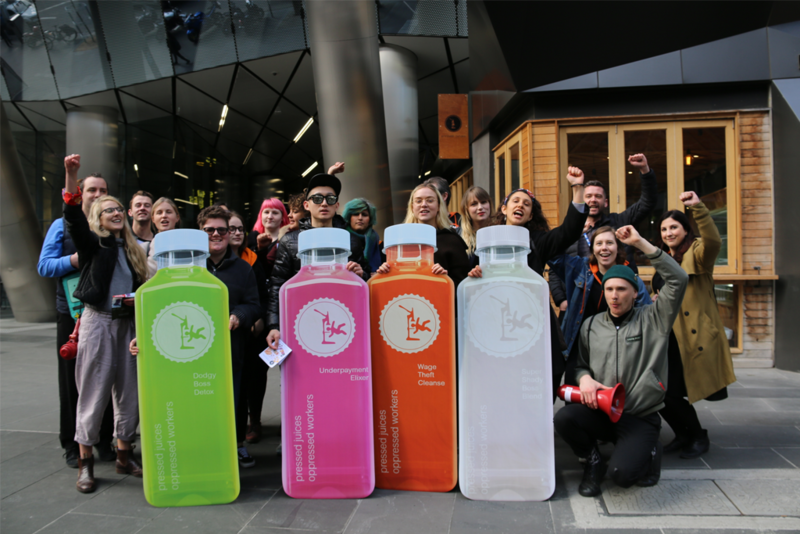 On the first of August, a group of young workers gathered outside the Melbourne store of popular juice chain Pressed Juices to stage a protest. Handing out free cups of juice to passers-by, the workers shared their stories, alleging that Pressed Juices owed them hundreds, even thousands in unpaid wages and superannuation. That, as it turns out, appears to be just the tip of the iceberg. Since we reported on the workers’ protest, Junkee has been inundated with emails, calls and messages from former Pressed Juices workers with a range of allegations of wrongdoing to level against their former employer. This isn’t just about a small Melbourne store, either – Pressed Juices boasts on its website to have grown to a team of 120 personnel and 22 stores Australia wide (though this no longer appears to be accurate, as many of the stores have since closed). According to some of its former workers, Pressed Juices has been failing to pay wages and superannuation for years, with disputes over unpaid wages continuing to this day. On more than one occasion in the past, Pressed Juices also transferred workers to different companies, after which the previous company went into liquidation, leaving insufficient assets from which to pay workers what they are owed. It’s not just the workers who remain unpaid, either. Multiple former Pressed Juices workers have described to Junkee the unpaid rent that caused them to be locked out of stores around the country. Junkee has spoken to 19 former workers who claim they are owed wages or superannuation from Pressed Juices. In some cases, these workers are still owed thousands of dollars, which they have been unable to recover despite months of correspondence with liquidators, the ATO, and their former employer. They’re pissed off and ready to share the real story behind Pressed Juices and its co-founder, Leo Pegoli, who was named by multiple former employees of the business as the individual who received their complaints of underpayment, promised to pay up, and then failed to do so. It’s unclear whether Pegoli is still associated with Pressed Juices – while he has corresponded with former workers about owed pay until as recently as July 2018, he has done so from a personal email address and social media accounts. Leo Pegoli did not personally respond to multiple requests for comment from Junkee. Lawyers representing PJ Works Retail Pty Ltd and Pressed Juices Works Pty Ltd, two of the companies currently associated with the Pressed Juices business, did get in touch to say they had received our email to Mr. Pegoli, and to warn us that the allegations included in that email “pertain exclusively to the previous owner of the businesses”. 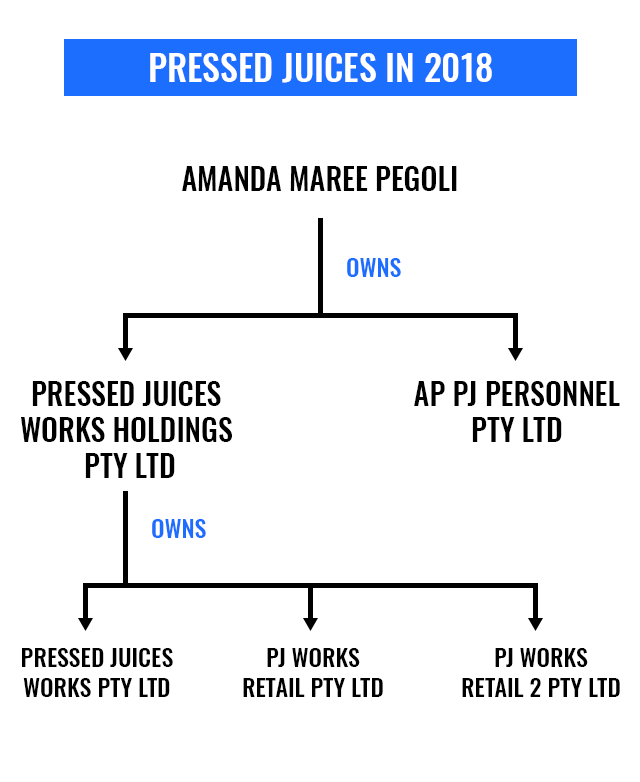 The current owner and director of PJ Works Retail Pty Ltd and Pressed Juices Works Pty Ltd is Leo Pegoli’s sister, Amanda Maree Pegoli, who also owns AP PJ Personnel Pty Ltd, the company listed on Pressed Juices pay slips issued in 2018. At least four of the workers Junkee has spoken to say they are owed thousands of dollars in wages or superannuation by AP PJ Personnel Pty Ltd, which they have still not received in full despite repeated requests. It appears, therefore, that many of the allegations in this story do not pertain exclusively to previous ownership, but apply to Pressed Juices as it exists today. Amanda Pegoli did not respond to our requests for comment, but we’ll update this story if we hear from her in future. Pressed Juices was launched in 2013, with Leo Pegoli as CEO and Natasha Waters (who is no longer an employee of Pressed Juices) as business and retail manager. If you believe the about page on their website, the project was a starry-eyed, health-based venture: “a space that allowed them to teach, share and provide products that enabled Australians to live a positive life”. And for a while, it was just that – until things started to go wrong. Around 2015, according to former staff who spoke to Junkee, pay started to arrive late on a regular basis. The pay cycle was fortnightly, but in reality payment began to be anywhere from days to weeks late, until sometimes two or more pay checks were due at once. “In my time working for him, it got too stressful towards the end. It was starting to impact on my personal life, because wages were paid fortnightly and some weeks it would be a week or two weeks late,” one former employee, who wished to remain anonymous, told Junkee. And then there was superannuation, which staff assumed was being paid because it appeared on pay slips. “I guess I was a bit naïve,” another former staffer told Junkee. “I thought that that was getting paid”. It was only as the news spread through word of mouth that staff began to check their superannuation accounts, and gradually discovered that they were not actually receiving the payments they were owed. In some cases, staff found they’d been receiving super up until mid-2015, at which point the payments stopped coming. In other cases, staff found that they had never been paid super during their employment with Pressed Juices, and in one case that the company had never even set up a super account for them as requested. One worker provided superannuation records to Junkee showing that from 2013 to 2016, their super payments from Pressed Juices were routinely late and many months apart, sometimes arriving six months late and, once they arrived, often skipping owed months entirely. The worker has not received a superannuation payment from Pressed Juices since early 2016, despite still being owed thousands of dollars in late payments, and continuing to work for Pressed Juices after that date. By the time they left the company, they were owed over a year’s superannuation payments. Workers protesting outside the Melbourne Pressed Juices store in August. Supplied: Young Workers Centre. At first, many of the unpaid workers responded by approaching management, sure that there must have been some mistake. Some workers contacted Leo Pegoli directly, while others contacted their supervisors or the Pressed Juices head office. One of Pressed Juices’ former online managers, who worked at head office, told Junkee that she routinely received workers’ complaints about late or missing pay. “The upset phone calls and emails were endless,” she said. By all accounts, Leo Pegoli was usually unconcerned and reassuring, saying that there had just been a hold-up, or that the company was waiting on a government payment to come through. “When I approached Leo with these issues he would always assure me that money was coming and that we were simply waiting on a ‘government grant’”, the former online manager said. So workers waited, and waited, and yet in many cases the pay never arrived. Helena, who was previously an employee at one of Pressed Juices’ Sydney stores, showed Junkee pay slips and bank statements from March to October 2018 that demonstrate that she is still owed more than $4,300 from her final Pressed Juices payslip. She also shared screenshots of her text messages to Leo Pegoli attempting to chase up this pay, which were sent throughout April this year. He has not replied, though in October of this year Helena was surprised to discover that $1000 had been transferred to her bank account from “PJ Works Retail Pressed Juices”. It’s not clear what Pegoli’s official role in the company was during the time Helena was contacting him, but Helena’s understanding was that Pegoli was the person to approach about late pay. Pressed Juices Retail Pty Ltd company documents she signed in June 2017 listed Leo Pegoli as the company’s director, and as far as Helena was aware he still occupied this role, though in actual fact in March 2018 she was being paid by a different company directed by Amanda Maree Pegoli (AP PJ Personnel Pty Ltd). Helena was not the only employee under the impression Leo was the person to contact about pay, though – she also shared screenshots of her conversations with the Pressed Juices regional manager and accountant at the time, both of whom suggested she contact Leo Pegoli about her late pay, or promised to contact him on her behalf. Left: Helena’s messages to Leo Pegoli about late pay. Right: Helena’s messages to another manager at Pressed Juices asking if they have been able to get in touch with Leo Pegoli. Helena isn’t the only worker who’s had trouble getting in touch with Leo Pegoli regarding her wages. Another former employee, Jenna, told Junkee that she and her partner José made multiple attempts to chase up their unpaid super, as well as José’s unpaid final pay check, in the months before and after they left the company in late 2017. Over several months, Jenna said she spoke to Leo Pegoli in person and via email, as well as speaking to the Pressed Juices accountant and the liquidators of Pressed Juices Personnel Pty Ltd, the company listed on José’s final pay check. “Each time that we told [Leo Pegoli] he’d sort of act like it was the first time that he’d heard it, and sort of play dumb, and make these promises, like ‘okay I’m going to head office now, we’ll get it all sorted out now’, that sort of thing,” Jenna said. Meanwhile, in 2016 a court ordered that Pressed Juices Personnel Pty Ltd pay one worker a five figure sum in outstanding wages and entitlements, though this payment never arrived. It ultimately took another two years, but eventually she received her payout – not from Pressed Juices, but from the Australian Government’s Fair Entitlements Guarantee, a safety net intended to help out workers who lose their jobs when their employers go into liquidation or bankruptcy. But while Pressed Juices Personnel Pty Ltd and Pressed Juices Retail Pty Ltd went into liquidation in 2017-18, other Pressed Juices entities have not, and the business is still operating today. It wasn’t just the workers who weren’t getting their dues – in multiple cases, former employees allege that Pressed Juices stores have been evicted, or come close to eviction, for not paying rent. 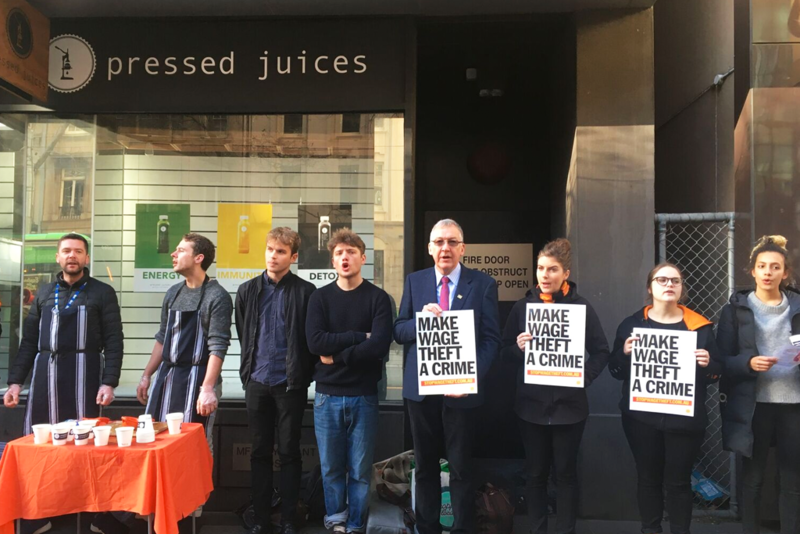 Multiple former Pressed Juices workers told Junkee about turning up to work to find that the locks had been changed by irate landlords, or that For Rent signs had been placed in the windows, describing incidents occurring from 2016 to as recently as January 2018. “There was one case when I did rock up one morning to set up and the landlord or centre management had changed the locks,” one former store manager who worked for Pressed Juices from late 2015 to mid 2017 told us. A number of other store managers at the company in 2016 described being told to shut down and clear out a store with only a few days’ notice. “I was called one afternoon on my day off and told that my store would be closing in three days’ time,” one former store manager told me. “I was shocked and upset for my staff…most of my team were just let go with only three days’ notice.” Another manager relayed a similar story, saying Leo Pegoli called on a Thursday or Friday to say the store would be closing, and that everything needed to be packed up and gone by Sunday – three days later. A third manager said Leo Pegoli called her and told to shut down her store immediately, without even a day’s notice, and left on her own to arrange removalists and tell her staff members they were now unemployed. In reality, Pressed Juices was doing anything but “staying where we are”. Behind the scenes, it was repeatedly transferring its workers to new companies shortly before the old company went into liquidation, which hugely complicated workers’ attempts to track down the pay they were owed. 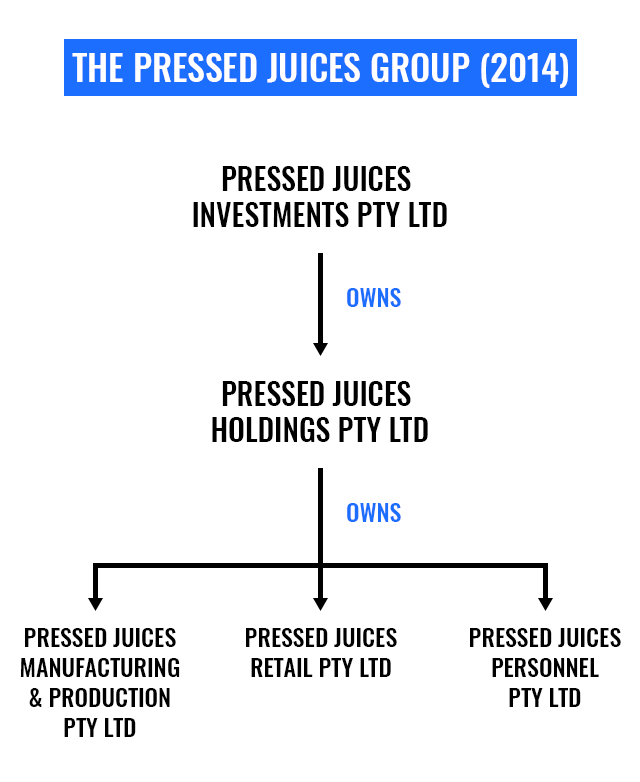 Initially, Pressed Juices operated as a company called Pressed Juices Pty Ltd, but in October 2014 the business’s assets were either sold or transferred to a group of related companies we’ll call the Pressed Juices Group for now. The Pressed Juices Group in 2014. Soon afterwards, workers began to be shifted over too. In June 2016, workers previously employed by Pressed Juices Pty Ltd received a letter updating them on their transfer to Pressed Juices Personnel Pty Ltd as part of a company restructure; in the same month, Pressed Juices Pty Ltd entered external administration and was found to be insolvent, unable to pay its debts. A year later in June 2017, it happened again: this time on June 2, employees of Pressed Juices Personnel Pty Ltd were asked to accept a transfer to Pressed Juices Retail Pty Ltd; on June 5, Pressed Juices Personnel Pty Ltd was put into liquidation. A report by the liquidators from September 2017 reveals that the company owed millions, though the exact figure was unclear as its director, Leo Pegoli, first failed to actually provide the liquidators with the company’s records, and then eventually provided incomplete records. The different companies that appeared on Pressed Juices pay slips over time. It looks likely that a third transfer also occurred at some point – Junkee has also seen payslips issued in 2018 from another company named AP PJ Personnel Pty Ltd. A worker with these pay slips said they do not remember being informed that a new company would be paying them, and were confused to receive two payment summaries at the end of the financial year. In the letters employees received in 2016 and 2017 asking them to accept employment with a new company, they were told how the transfer would affect them. They were assured that their accrued annual leave and entitlements would all be transferred over, that their service with the previous company would still count towards long service leave, and that their role would essentially remain the same. In a separate section, the letter dated June 2016, which was signed by Leo Pegoli as director of Pressed Juices Personnel Pty Ltd, also mentioned that outstanding superannuation contributions could not be transferred to the new company, but promised that “we have told the administrators that we intend to pay all outstanding superannuation contributions in full and this is likely to occur in September this year”. The letter dated June 2017 did not inform employees that outstanding superannuation contributions could not be transferred. Intending to pay, however, is not the same as actually paying. A company needs money to pay a debt, and when liquidators are appointed they are generally selling everything the company still owns to get that money and pay as much debt as they can. Needless to say, following all of this was really confusing for the workers waiting for pay or superannuation. 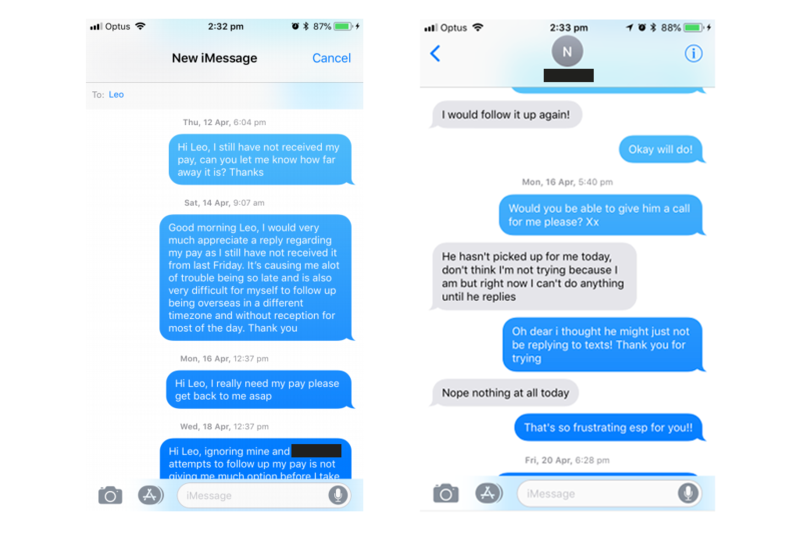 In Jenna and José’s case, contacting the liquidators about all of this was especially difficult, because a number of their payslips still showed the company name Pressed Juices Personnel Pty Ltd even after they’d agreed to transfer to Pressed Juices Retail Pty Ltd.
What Happened To Leo Pegoli? Over time, Leo Pegoli’s role at Pressed Juices also gradually shifted. Initially, he was listed as founder and CEO on the company’s website, but over time all mention of him has been removed. Leo was also initially listed as a director of many of the companies associated with Pressed Juices, but this too gradually changed, with family members taking his place. Here’s a brief sketch of the way Leo Pegoli’s role at Pressed Juices has changed over time. For the first part of the business’ existence, when it operated as Pressed Juices Pty Ltd, Leonardo Pegoli was listed as that company’s director. 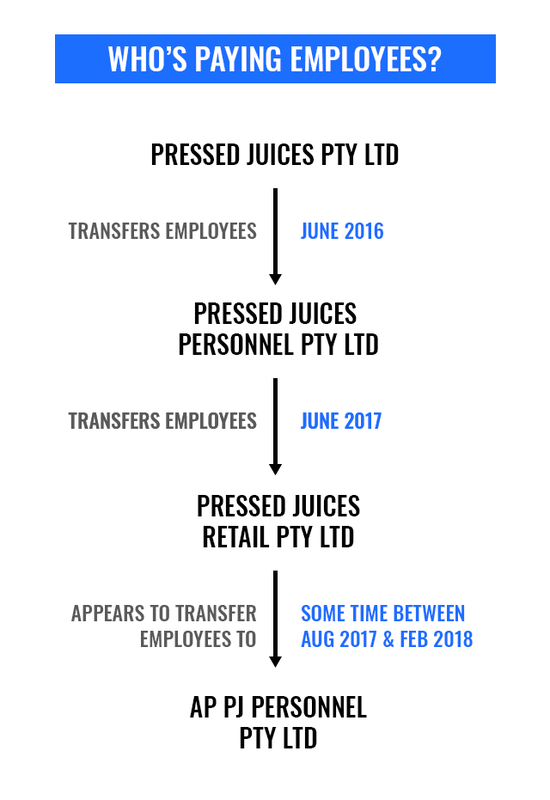 Leo Pegoli was also listed as the director of the companies to which Pressed Juices Pty Ltd’s assets and workers were transferred from about 2014-2017: Pressed Juices Personnel Pty Ltd, Pressed Juices Retail Pty Ltd, and parent company Pressed Juices Holdings Pty Ltd.
From May 2017 to August 2017, Leo Pegoli was also listed as the director of Pressed Juices Works Pty Ltd, one of the companies currently associated with the Pressed Juices business. But then, in August 2017, things started to change. Leo Pegoli ceased to be director of Pressed Juices Works Pty Ltd, and was replaced by his sister, Amanda Maree Pegoli. Also in August, a series of new companies named PJ Works Retail Pty Ltd and AP PJ Personnel Pty Ltd were registered with Amanda Maree Pegoli as sole director. These two companies are also currently associated with the Pressed Juices business — PJ Works Retail Pty Ltd is listed on the company’s website and in emails from the company’s lawyers, while AP PJ Personnel Pty Ltd appears on pay slips issued in July 2018. Meanwhile, Leo Pegoli continued to be removed from directorship of Pressed Juices companies. In October 2017, he was replaced as director of Pressed Juices Retail Pty Ltd and Pressed Juices Holdings Pty Ltd, again by a family member – Vincenzo Pegoli, who is listed as having the same address as Leo. By early 2018, many of the original companies Leo had been listed as director of were under external administration (Pressed Juices Pty Ltd, Pressed Juices Personnel Pty Ltd entered external administration before 2018; Pressed Juices Retail Pty Ltd had liquidators appointed in March). By March 2018, Pressed Juices workers were receiving pay slips from AP PJ Personnel Pty Ltd, a company with Amanda Pegoli as its owner and sole director. The company structure of Pressed Juices as it exists today. In short, multiple Pressed Juices workers confirmed that Leo Pegoli was still operating as if he was involved with Pressed Juices long after he ceased to be its director. While the companies associated with the business were in his sister Amanda Maree Pegoli’s name, Leo Pegoli remained the person interacting with workers regarding long-running pay disputes and concerns. Leo Pegoli did not personally respond to Junkee’s repeated requests for comment for this story. When we reached out to Amanda Maree Pegoli, she refused to allow us to provide her with a list of questions and allegations pertaining to Pressed Juices under her directorship, instead hanging up the phone. Lawyers representing Pressed Juices have written to Junkee stating that the allegations in this story “pertain only to previous owners of the business” and that the completion of the transactions where the new owners purchased the business “took place some time ago”. However, in the time that Amanda Pegoli has owned and directed the business, workers have continued to allege that they are owed wages and superannuation. We’ve spoken to four former employees who are each owed thousands of dollars in wages and superannuation by AP PJ Personnel Pty Ltd – money they still haven’t received despite repeated attempts to contact company management. We’ve written about two of these workers, Hannah and Mingka, previously. Both are owed pay and annual leave that should have been paid in March this year – in July, the pair got in touch with the Young Workers Centre (YWC), which has been contacting Pressed Juices on their behalf ever since. 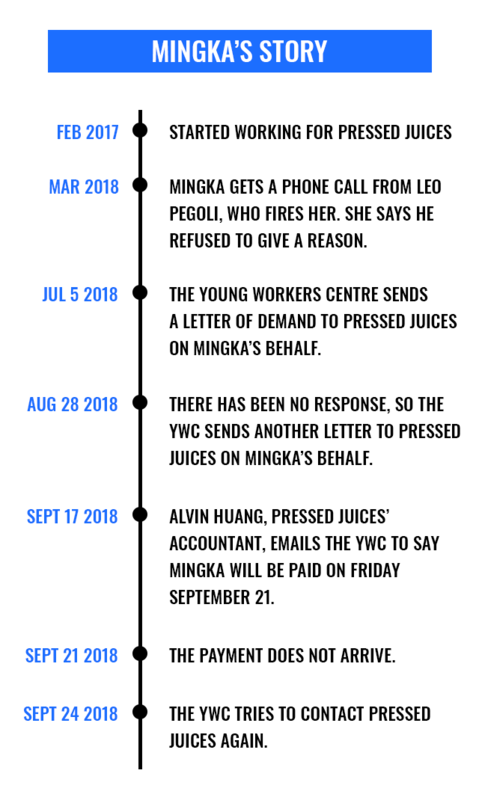 On July 5 and August 28, the YWC sent Pressed Juices formal letters of demand outlining how much Hannah and Mingka were respectively owed, and reminding the company of its legal obligation to pay them. One worker’s experience trying to track down the money Pressed Juices owes her. For months, there was no response. Then, on September 17, the YWC received an email from Pressed Juices accountant Alvin Huang, who acknowledged receipt of the letters of demand and confirmed that Hannah and Mingka would be paid the amount owed that coming Friday, September 21. Mingka told Junkee she was thrilled, if sceptical, and the YWC provided Pressed Juices with her updated bank details. But Friday September 21 came and went, and the payment never arrived. On Monday September 24, and again on September 26 the YWC attempted to contact Huang, but there was no response. For many of Pressed Juices’ former workers, the way forward is unclear. While many are still owed wages and superannuation, they’ve run into dead ends trying to track it down. Since we started reporting this story, however, a small number of former workers have received payments from Pressed Juices. Helena, who was owed more than $4,300 from her final Pressed Juices pay slip issued in March, received an unexpected bank transfer of $1000 from “PJ Works Retail Pressed Juices” on October 18. Helena was initially surprised to receive this payment – while she had sent another follow-up message to the company’s Instagram page the week before, she had given up hope of actually receiving what she was owed. After the payment arrived, she discovered that one of her family members had been calling Leo Pegoli on her behalf for months, and that according to that family member, Pegoli had agreed to pay back her owed wages in instalments. Another former Pressed Juices employee, Bailey, has been owed close to $3,000 in outstanding wages from AP PJ Personnel Pty Ltd since he left the company on April 1 this year. Bailey told Junkee he has been calling Leo Pegoli regularly about the outstanding pay, and that in early September Pegoli agreed to begin paying him in instalments. Junkee has seen bank records showing that Bailey has so far received three payments from “Pj Works Retail” — a payment of $290 on September 3, $300 on September 10, and $300 on October 9. “I had to chase him hard to make him pay,” Bailey said, noting that the instalments have been irregular, and that with nothing in writing from Pressed Juices confirming the instalment system he’s not sure what to expect. A spokesperson for the Fair Work Ombudsman told Junkee that while they cannot comment specifically on the situation at Pressed Juices, they encourage all workers who are concerned they have been underpaid or treated unfairly to get in touch at www.fairwork.gov.au or the Fair Work Infoline on 13 13 94. You can also see the website for an interpreter service, or to submit an anonymous report if you’d like. Junkee will also continue to investigate Pressed Juices, and we’ll keep you posted on any developments. If you know more, and want to get in touch, you can reach us at slangford[at]junkeemedia.com. 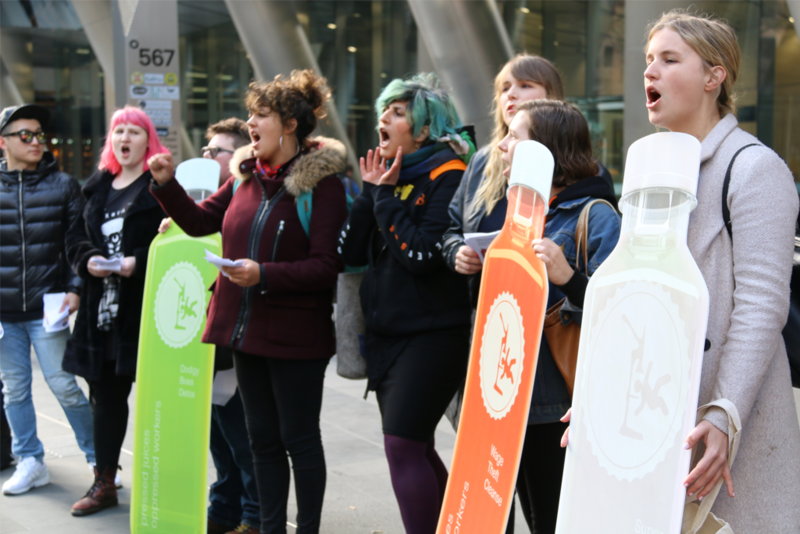 Feature image of workers at a rally outside Pressed Juices in August, courtesy of the Young Workers Centre. Sam Langford is a Staff Writer at Junkee. They tweet at @_slangers.